Chapter 2: "Sword of Valor"
The Wrath of the Righteous Adventure Path continues with “Sword of Valor,” by RPG Superstar Neil Spicer. The PCs, now invested with righteous mythic power, are poised to become the greatest heroes of this seemingly endless war against the demons of the Worldwound… provided they can succeed at their first mission. The citadel city of Drezen was once a symbol of the First Crusade’s triumph against the Worldwound, yet when a larger horde of demons attacked, they shattered Drezen’s defenses and captured both the citadel and the crusaders’ symbol of power. Can the PCs help lead an army north to reclaim Drezen and recover this potent relic, or are they marching their comrades and followers to a gruesome demise? 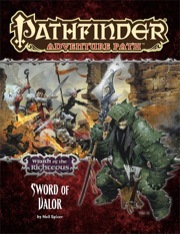 “Sword of Valor,” a Pathfinder RPG adventure for 6th-level characters with 1 mythic tier, by Neil Spicer. The search for a rogue demon hunter in the Pathfinder’s Journal, by Robin D. Laws. The story of this AP is fun, flavorful, and appropriately epic. The PCs get lead armies, march into the Worldwound, and try to reclaim a city from the demons! A much more epic task than the ones usually given to PCs of this level. That said, we found the encounters in this AP to be on the easy side for mythic PCs, especially once the PCs gain their second mythic rank. The "boss fight" at the end of the AP is a bit more challenging, but not difficult enough to scare the players, or make the outcome in doubt. Sword of Valor is an enjoyable, worthy sequel to the Worldwound Incursion. The heroic (and now mythic) PCs must help their beloved city by marching into Drezen and reclaiming it for the Crusaders. Drezen is a huge place that offers many exciting encounters, enemies, treasures and chances for the players to prove themselves true champions. Once again players have the opportunity to connect with their NPC allies from the first chapter, as well as make new friends. The NPCs in Sword of Valor are complex, layered, likeable people. Not all of them are what they seem, and PCs can take a hand in helping them solve their problems and reach their potential. This makes to very interesting story-telling and gives players a chance to develop their own characters as they interact with NPCs. Mass combat rules start to really come into play at this point. GMs and players who like new challenges may enjoy this feature. Our group did not, so our kind GM managed to work around that part and found that offering more traditional combat rules worked just as well. Reclaiming the city and citadel are fun victories for the players and their characters. The sword of valor itself is a wonderful artifact that will go a long way to protecting the city of further invasions. This helps the story because players can now go on with their travels and adventures without having to worry about crazy things going on behind their backs. This adventure has a lot of great story to it and was super fun to play. 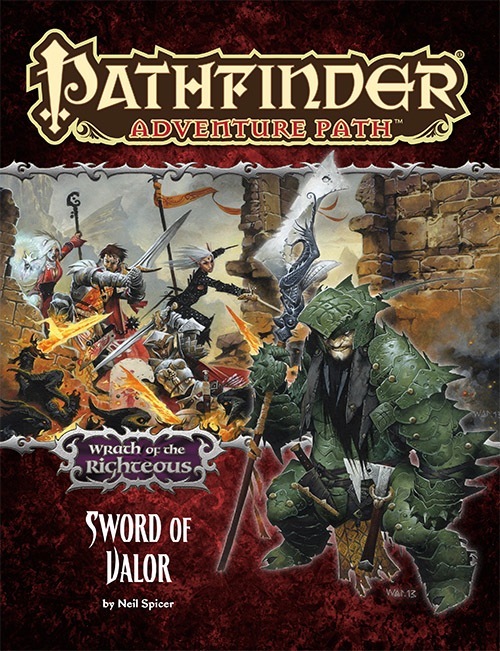 DISCLAIMER I've written this review as a player participating in the Wrath of the Righteous adventure path. I have not read the adventure or its backmatter, and so I cannot comment on the quality of the writing or specific mechanical elements of the adventure. Furthermore, it is quite possible that my GM has tweaked parts of the adventure to fit our group of players. I can, however, provide an account of my impressions of the adventure after a successful playthrough. Also, this review contains spoilers for Wrath of the Righteous #2: Sword of Valor. With that out of the way, let's see how this adventure performed at the gaming table. As the second installment in the Wrath of the Righteous adventure path, Wrath of the Righteous #2: Sword of Valor continues the epic story of a righteous crusade launched against the hordes of demons that threaten to undo the world. The demons have been driven from the ruined fortress city of Kenabres, and the momentous events that wrapped up the first book have all but destroyed the wardstones. All is not lost, however, because the heroes are here to save the day, fueled as they are by mythic powers. The question is, did the heroes have fun? The premise of the adventure is simple: With a mandate granted by Crusader Queen Galfrey, the heroes lead an army of paladins into the Worldwound. Their mission is to deliver the occupied city of Drezen and find the powerful Sword of Valor. As a result, the adventure is divided into three parts: the march through the Worldwound, the assault on the city, and the search for the Sword of Valor. The first part, the march through the Worldwound was my favorite part of the adventure. It featured everything I hoped it might - mass combat, despair, evil machinations, betrayal, all of it set against the backdrop of the Worldwound. This part of the adventure offered plenty of opportunities for some fun roleplaying, and it gave another glimpse into the wickedness of the demons and their allies. More importantly for me, though, it showcased one of the strengths of the demons in the Pathfinder RPG - their different approaches to the concept of destruction. It is easy to think of demons as one-trick ponies whose only modus operandi is SMASH KILL MAIM! That would be a mistake, though. During the heroes' march through the Worldwound, their resolve was tested as the forces of evil constantly sought to destroy the army through subtle means. Whispered suggestions and damning words of despair, infiltrations of the army camp, soldiers accusing fellow soldiers of crimes committed by agents of the Abyss. The mass combat was a mixed affair. I had fun as I took an active part in the planning and execution of the battles. Our GM did a good job describing the battles. However, if you were to ask some of my fellow players, I fear their enthusiasm might not be as profound as mine. It seems to me that the mass combat system created by Paizo lacks something in the sense that, as written, it fails to provide an immersive experience for everyone at the table. The second part of the adventure, the assault on Drezen, featured more mass combat as our army fought the city's defenders. We spent quite a bit of time debating how best to approach the liberation of Drezen, debates based on intel provided by scouts. Each section of town would grant us certain boons, so it was a matter of us to weigh those boons against the level of resistance present in each section. For me, this part of the adventure featured one of the higlights of the campaign so far. The annihilation of our army of paladins. The paladins had crushed all resistance with a single army remaining - a band of disorganized cultists. Based on our GM's description, there was no indication that this army would present a significant obstacle, and so our army took to the field. A couple of abysmal dice rolls later, both armies were destroyed. The battle showcased another issue with the mass combat rules. It's entirely too easy for a poor die roll or two to destroy an army. We turned what I felt was a low point in the campaign into the highlight it became through a great bit roleplaying. 100 men had sacrificed their lives to clear a path to the citadel for us. They had endured through several battles against a determined foe before the onslaught had become too much for even our valiant holy warriors. The impromptu memorial was one of the best roleplaying sequences I can remember enjoying in my many years playing roleplaying games. Finally our heroes were ready to assault the Citadel of Drezen itself and avenge our fallen brothers-in-arms. This third part of the adventure contained a traditional dungeon crawl, and it started with a bang. As our heroes approached the citadel, we were attacked by what I can only assume was a mythic chimera. What a fun encounter that was. Very cinematic and against an extremely tough opponent. The citadel had its share of demonic minions as well, and the first real Boss of the campaign - Staunton Vaine - was slain. All in all, the citadel was a relatively traditional dungeon, but enough demon taint was there to give it that extra flavor. I suspect that some of the encounters in the citadel were placed there by our GM, so I won't comment on those, just in case my suspicion is correct. As I mentioned earlier, I played through this adventure as a player, and as such I don't have any insight into the mechanical aspects of the adventure. However, I *can* comment on the general level of the challenges that were thrown at our characters. With a couple of exceptions, the encounters in this adventure felt a bit light. I didn't feel that we were really challenged. The exceptions, however, were brutal. The above-mentioned chimera brought my character to negative hit points and for a while we feared it might be a TPK. Another encounter, this one in the citadel itself, resulted in the deaths of two characters. For the most part, Wrath of the Righteous #2: Sword of Valor was absolutely stellar and dripping with flavor. Lots of roleplaying opportunities (including meeting Crusader Queen Galfrey herself), interesting locations, NPCs with incredible depth, and some fun encounters. While this adventure did have a weakness - the mass combat - my overall impression is that this is a very well written adventure. Thank you, Neil Spicer, for another fine installment in the Wrath of the Righteous adventure path. First, I would like to mention the quality issue. I have now finished running the first two parts of Wrath of The Righteous and both books have fallen apart. This is the worst of the two with large sections now falling out. The quality of the binding on these books has been disappointing. What about the adventure itself? There are a lot of things about it that I like. It has a heroic feel that fits well with the theme and tone of the adventure path. I like the idea of the characters leading the counterattack against the forces of the Worldwound at the start of the 5th Crusade. It does a good job of using the NPCs, both heroic and villainous. There are a lot of good encounters and interesting twists. It sets up Drezen for later books. There are a couple of things I don't like about it. The mass combat system is a novelty and it is overused early on. Mass combat just isn't that involving for most of the players. Several of the maps in it are very large and expensive to print to scale but largely unused. The Citadel Drezen map was huge and expensive to print but consisted mostly of empty rooms. The Gibbering Swarm map used earlier on is a prime example of a map that is far bigger and more expensive to print that is warranted by the few encounters on it. I've been running Wrath of the Righteous for my normal gaming group, and we are enjoying it greatly. The mythic rules are well-liked, for the most part, and the setting is loved. The issues we've had are 1) a lack of stand-alone mythic feats, instead of those augmenting pre-existing standard feats, and 2) the mass combat rules. My group really dislikes them, so I have had to move to a more cinematic description of the battle, with more standard encounters representing their part in it. This has worked well so far, but it was a bit tricky for me to do on the fly as a relatively new GM. This option was recommended in the adventure path itself, but I wish there had been an appendix with stat blocks for those of us who honestly dislike the mass combat rules but aren't so good at balancing encounters on the fly. I did have what, based on other reviews I have read, is apparently an existing issue. I got the Sword of Valor hard copy and, within a half hour of starting to run the game, the book began to fall apart on me. The first 16 pages came completely out of the book. It was a major irritation, but not one that will prevent me from continuing to use the hard copies of the adventure path. I just wish the quality control was a bit more on the ball. That said, I highly recommend this adventure path. It is an enjoyable game, with plenty of options for those who want their characters to feel Mythic. I really like the cover art, even though it is only a mockup. Very nice! Seconded. Who/what is that person in the foreground? That is the 20th level cleric of Asmodeus from the NPC Codex. This sounds very promising indeed. War. Demons. Ruined crusader stronghold. Lost sword. September can't come quickly enough! The more small little details I get about this adventure path, the more I want it. James statting up demon lords just makes it all the sweeter! I don't understand Glabrezu's they are suppose to be huge, but on all images I see of them they are not bigger than Large. Are they young Glabrezu or what? Notice the glabrezu's posture. It's fighting a paladin and standing straight when in combat with a paladin isn't a good idea. When standing straight, I'm sure this glabrezu is quite a bit taller. Wow! That's some fast advancement! This makes me REALLY want to play, very badly. That's just a mock-up, guys...not an indication that you'll necessarily be fighting a glabrezu. We start out at level 6 in this one? Sounds like we'll be going all the way to 20 by the end of the series. Anyone know if thats the case? 20th level and 10th mythic tier is the whole of it. Yeah; that's not only a mock-up picture of a glabrezu... but it's from a VERY old piece of art from several years ago. It's true, though, that glabrezus tend to be illustrated on the small side of their scale for whatever reason. We do what we can. Correct; the plan is to try to hit 20th level. Mythic characters gain XP faster so that should work... maybe. This one MIGHT end up with PCs starting at 5th level. I won't know for sure until I'm done developing part one... which should be by Sunday night or before that. That said... starting at level 6 isn't new. We did the same thing with Shattered Star, part 2. Well, I don't mind actually, I like Glabrezu's better in large stature, it suits them more. Especially since the much more powerful Balor is only Large, I think the other way around would be better so the pictures scale actually looks very nice to me, but i'm confused as the glabrezu's entry always said Huge but I never seen it huge. Well, heres to hoping the xp curve works out for a lvl 20 crew by the end. Sometimes I forget you guys have to go by the numbers when you design these and can't just wing it like a regular DM might. On the other hand, one of the reasons I buy these(aside from the excellent storylines), is to see how the people in charge handle tossing out encounters. Never easy writing premades for high level, let alone max level, looking forward to seeing how you lay it out. Really looking forward to this AP series! It looks like it's going to be a ton of fun! Now, If I can just get my group to play it. For some reason the seem to never want to play an AP and would rather canibalize things out of the books. I myself would have tons of fun playing through these APs! So by the volume 6 of this AP, we will get stats for 6 demon lords. Xoveron is showing up in volume 1's bestiary. Given the titles of adventures 4 and 5, I'll go ahead and assume that Baphomet and Nocticula will be the Demon Lords there. No surprise about Nocticula, as I believe James has claimed her as his favorite PF Demon Lord. Since Deskari is likely the BBEG, he'll probably be statted up in volume 6's appendix rather than its besiary, meaning that volume 6 could have 2 Demon Lords. As for who gets the bestiary treatment in volumes 2, 3, and 6... no clue. I think the forum has a spambot? Actually, once you've watched a thread, it'll keep showing "x new posts" after the thread title until you've not clicked into it for a fairly long while. Updated product with final cover and description. ooh! We get some WAR goodies with this AP! Sweet! Well, from the eyes, my first impression is that is a dead dwarf walking. Upon seeing Jason Nelson's contribution, I've concluded he's likely to fight like a dwarf possessed. And in one of the "What AP do you want next" threads, I was rooting for a mythic dwarf AP, where James said the first mythic NPC encountered is a dwarf. So I'm guessing he's the villain of the piece. Actually by the symbol on his helmet, the creature depicted on his weapon, and the style of his armor, he is a servant of the BBEG Deskari. I'm really confused what angle Seelah is at on the artwork. Is she standing, or laying, or slanted or something? I'd say she's leaping down from the breach in the wall (presumably onto the vulnerable part of a demon in dire need of some righteous smacking). Ooh, I'm proud to bursting to see my name up there with such luminaries in my first AP support article! Awesome Ron! Congrats and I look forward to reading it. Oof, wasn't this supposed to come out "early September"? I guess the delays from August forced a move to the back of the month. IIRC, Dagon and Pazuzu (and one other that I can't recall right now) are being statted up in Bestiary 4. Maybe Abraxas? Are the Iconics fighting Fiendish Minotaurs with Flaming Swords?